Has the Long-Term Increase in Food Stamp Usage Finally Come to an End? From June 2006 through June 2013, the number of New York City residents receiving food stamps (now known as the Supplemental Nutrition Assistance Program, or SNAP) increased by 71.1 percent, from 1.1 million to 1.9 million. From June 2013 through June 2014, however, the number of recipients fell by 118,000, or 6.3 percent. Recent decreases in the number of food stamp recipients likely reflect improvements in the local labor market. Nationwide, over the same June 2013-June 2014 period, the number of individuals receiving food stamps fell by a more modest 2.6 percent. 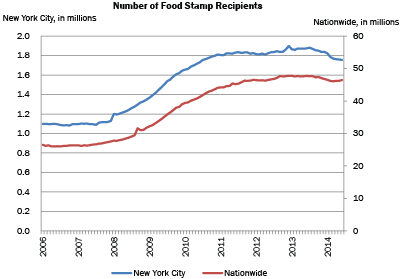 As a result of the decreased caseload as well as federal reductions in per family grant payments beginning in November 2013, total food stamp grants to city residents decreased by $244 million, or 6.9 percent, from fiscal year 2013 to 2014.